Coffee Houses in Gaziantep : Menengic & Osmanli Dibek Kahvesi. I love caffeine. I adore it. I think it is a wonderful substance and often drink more than six cups of Nescafe in a day. I can also top that off with a can of Redbull and on odd occasions, have to lie down because my over indulgence has bought on a caffeine headache. The last time I tried to detox from my addiction to caffeine, I could not function. Two hours into the day and I gave up. Therefore, it is a surprise to many people that I hate Turkish coffee. I think it is the vilest stuff that could ever pass my lips. I cannot understand how anyone can drink a cup and not throw up. So, hubby is a lifelong fan of Turkish coffee and when we were in the south east of Turkey, I should have guessed that at some point, I would be lined up for the ritual attempt to persuade me to drink a cup. I am used to seeing teahouses wherever I go in Turkey but Gaziantep also has a good amount of coffee houses and types of coffee that I had never heard of before. It was a big learning curve for me as I followed hubby from coffee house to coffee house. “What is it? I asked hubby while looking at the billboard advert. He then disappeared through the doors of the café. I assumed this meant we were stopping for a drink. He ordered two cups of coffee so I ran over to the waiter and promptly changed the order to one cup and a bottle of water. I refused to try it. The Menengic coffee is made from the terebinth berry. Zerrin from Give Recipe describes the taste as “interesting” making me believe that I did not miss a lot. The berry is a wild form of the pistachio nut and there is no caffeine in it. Perhaps that explains my lack of interest then! We had to pay attention though as hubby had ordered Dibek Coffee instead and the waiter was eager to explain that this was no normal cup of coffee. The establishment we were sitting in was called the Tarihi Gumruk Hani and they specialized in “Fincanda Pisen Osmanli Dibek Kahvesi”. It was quite a mouthful trying to repeat that but I eventually understood the translation. The word “Dibek” refers to mortar and all the ingredients in their coffee are ground by hand using a mortar and pestle. 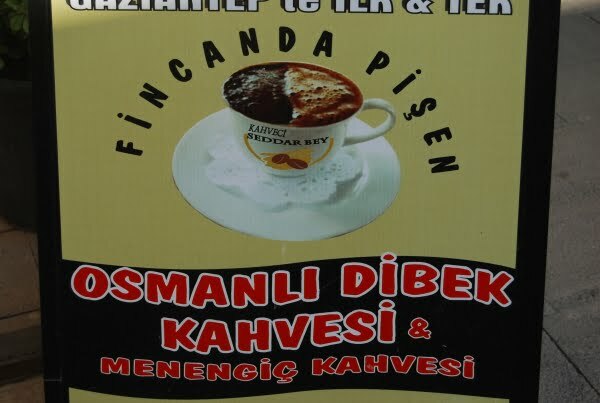 The words “Fincanda Pisen” meant the coffee was actually made in the cup and not using the traditional Turkish coffee pot. “Osmanli” means Ottoman, referring to the method an age-old tradition. However, no matter how hard my hubby and the waiter tried, I still could not appreciate the coffee or methods to warrant drinking a cup. Thinking I had been subjected to enough coffee rituals, we continued on our way but the next stop was the Tarihi Yenihan. Within the large courtyard of this ancient building, there was a small shop. At the back of the shop, steps led down to a large cave café. 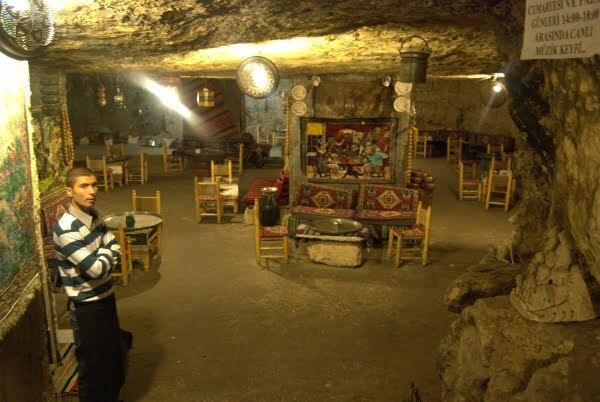 This coffee house was actually a novelty because I quite enjoy caves ever since I slept in a cave hotel in Cappadocia. It was not enough though to tempt me to try the coffee served in small, silver cups. 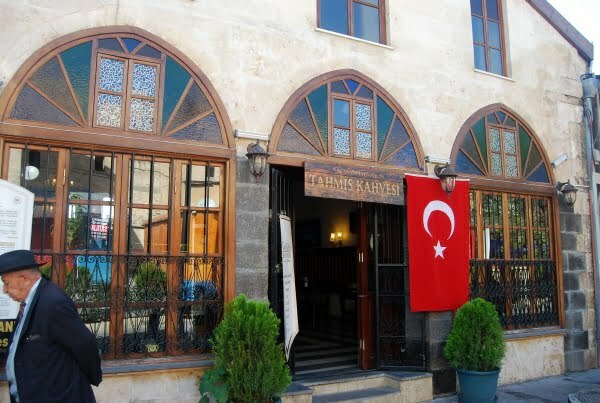 In terms of historical importance, the Tahmis coffee house has to come at the top of the list. It was built in 1635, to provide an income for the adjoining whirling dervish lodge and was rebuilt twice, in 1901 and 1903 following fires. I still had no desire to go in and try the coffee though. All I wanted was to sit down with a nice ice-cold beer. Unfortunately, all bars in Gaziantep are not visited by women unless they are ladies of the night. I had no interest in starting a new career so had to resort to sneaking black plastic bags containing Efes beer back to the hotel room! My husband cannot understand my lack of enthusiasm for the coffee houses of Gaziantep given my addiction to caffeine. Most certainly, I will not recommend to readers that they try the coffee when I would not taste it myself. However, I do recommend a visit to at least one coffee house in Gaziantep. It is worth it to understand that coffee is a big thing there! Readers Question: Turkish coffee. Love it or hate it? Very happy to see someone is talking about my country. I thank you first of all. For example, people in other cities can drink beer after the work, or go to a coffee shop before going home. But Gaziantep people eat Baklava before going home… They even eat dessert in the breakfast. Most of the people cannot eat sweet things in the breakfast. But they do.. They are very different people.. Their drinks like Dibek or Menengic are very different from official Turkish coffee :D.
Ok, thanks for reading my very bad English. Have a good day! You have tempted now you said it was absolutely divine! Such a shame you didn’t try it!! I too do not like sugar in my coffee, am a huge fan of coffee however not the bitter kind. I was hesitant to try due to the muddy consistency and Because it was already sweetened however gave it a shot. It was absolutely divine, a taste out of this world and like nothing i have ever tried! I am from Australia and trying to hunt me down a jar so i can attempt it at home. I don’t drink coffee either, could never get into the taste myself as well. Looking at the thickness and darkness of Turkish Coffee, I totally understand your hesitance. i love coffee , i’ve ever tasted Turkish Coffee . i want go there ^^ your blog is impressive. i;m in korea , There are no tasteable Turkish coffee. For next visit I am waiting you at Retaj Royale Istanbul for taste real Turkish Coffee. I actually had no idea there was such a thing as Turkish Coffee until I read this post. I’m not sure I’ve understood what makes it so different or yucky, but I’ll be sure to try for myself if I ever make it to Turkey. Those little silver cups are beautiful. I think for the amount they drink, it would have to be tea Andrew otherwise it would not just be yourself walking around with a caffeine headache! I think I would try Turkish coffee, but I don’t hold high hopes for liking it. I can do espresso, but not “normal” coffee and get to the caffeine headache stage after only a few cokes. Still I would try it. Have you got definite plans for a visit yet Dean? That is a first Abby. Never heard of caffeine fixing headaches. It normally gives one to me! Great read! I had forgotten, but this reminded me of being told all about the strange coffee when I was in Turkey. I actually don’t drink caffeine of any kind. But when I get a headache, caffeine can fix it! I think heart stopping is the right word Lillie! Coffee with cream!! Now you are talking!! Good to say that i have been there and done it Megan although not eager to repeat the experience! Sorry but there is no blog post about my finances. They are private matters which I am certainly not going to put on the internet. Re the coffee, I would not pay for it either! That second photo of the thick, rich coffee is heart-stopping! I want! I want! We had an amazing turkish coffee ice cream at the ice cream shop I worked at in college – but the reason I liked it was because it was covered in the cream. I can’t do coffee without my cream and sugar. What a great experience to have! I would love to visit a coffee house like this. I would love to know how you finance your travels, or what do you do for a living in Turkey? Is there a blogpost about this? Oh. Turkish coffee is strong, but I can drink it if it is offered to me freely as a guest. Would not choose to pay for it in a café! Wow that is an expensive caffeine addiction then. Can you not purchase it cheaper online? I tried Turkish coffee in Istanbul and wasn’t a fan either. And the Dibek Coffee looks like either pudding or an almost baked souffle. It looks so thick! We got hooked on Turkish coffee when we were in Akbuk for 3 months in 2010. My brother-in-law insists on a cup of Turkish coffee every night after dinner. Now it doesn’t seem right to end the dinner without it. We brought a year’s worth of Turkish coffee and Turkish tea back to the US with us and continued the tradition here. Each time we run out of Turkish coffee or tea we have to go to the Middle Eastern store to restock and it’s a lot more expensive here. . . this is how I get my fix – just need to figure out the intravenous bit! I don’t actually like coffee at all (I get my caffeine from Coke) so I definitely won’t be trying this! 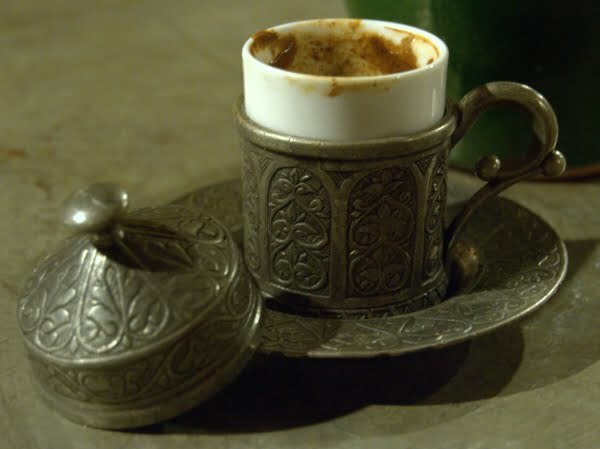 I am also a total caffeine addict but I really can not find anything to like about Turkish coffee. I think it is the texture I hate. Then I arrived in Urfa and tried a menengic. I loved it. It tasted of hot chocolate and pistachio. Our guide called it commagene, at least that is what it sounded like. We were told it is available only in that area. 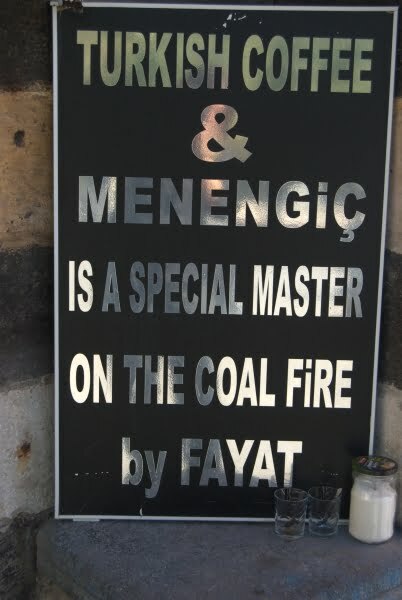 You should have tried the Menengiç kahvesi! it’s delicious. i drink most coffe without sugur, but ? was introduced to menengiç by someone drinking it sweetened, so ? have mine “az”, lightly sweetened, and it’s a smooth, nutty, dessert-like treat! 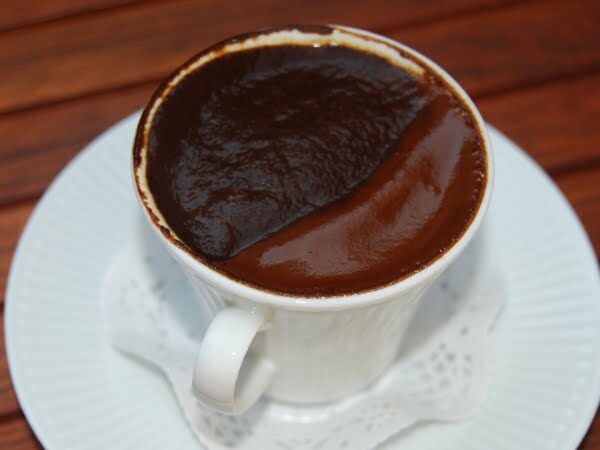 i don’t like when Turkish coffe is served with grounds floating on top, but when it’s made properly ? much prefer it to Nescafe. taste. But love the small silver cup with the lid. The turkish coffee required a lot of getting used to. I LOVE coffee but between a cappucino and turkish coffee, bring me the italian. But I LOVE menengic. I gave it a try at the Zinciriye Medresesi in Mardin and mannn, turkish coffee can be good. There was milk and sugar in there with a hint of pistachio and cardamom, I was surprised that it was good. Sadly, I did not encounter it anymore, once I left the southeast.